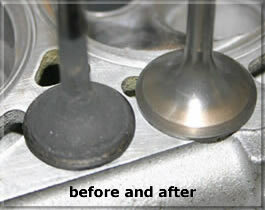 PhoenixMotorsport offers custom manufactured engine valves for a variety of uses. Our forge has a range of blanks from most die forms and we can offer a range of valve materials, heat treatments, stellite seat facing and bi-metal valves. 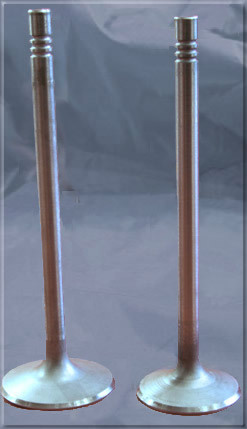 Valves are available in both undercut and non-undercut types. We offer pulse plasma nitriding to the valve stem to improve surface hardness whilst at the same time, retaining the corrosion resistance at the seat. Suitable for only bronze and cast iron guides, tufftriding is a surface hardening option which covers the complete valve surface, producing a satin black appearance. 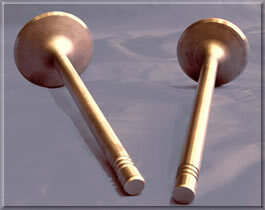 Hard chrome plating to the stem can be applied to 214N valves used in cast iron guides. Stellite 6 can be applied to the seat area on valves to increase hardness where seat wear is generally high, such as on highly stressed race engines or forced induction engines. The three most popular valve materials are 214N, 1.4882 and Nimonic 80A. •	214N was developed in the early 1960’s and retains it’s hardness up to 800 deg C, and has an excellent rupture strength and good creep and impact values. The Chromium content resists both scaling and Chlorine attack although it is not immune to Sulphur. •	Nimonic 80A has a higher temperature tolerance than 214N and greater corrosion resistance.